Really? Something like this is announced during Military Family Appreciation Month? Something like this is announced when there are still military-spouses looking for simple employment with each PCS? Something like this is announced when Military-Retirees and their families are looking at TRICARE fees hiked 100 to 500 PERCENT each year? Something like this is announced when the President tells us he stands for our troops. I highly doubt it. Here is an interesting thought a friend shared with me: When we give and give and give to the poor and don't empower them to earn themselves we take away their dignity; we hold them back; we let them stay in the grip of poverty. So let's stop being a nation of charity and let's SUPPORT those that are working hard to defend our nation instead of taking from them. It is like taking from the hands of the working to feed the poor. How about you? I hate being partisan. I hate confrontation. But this just made me mad. 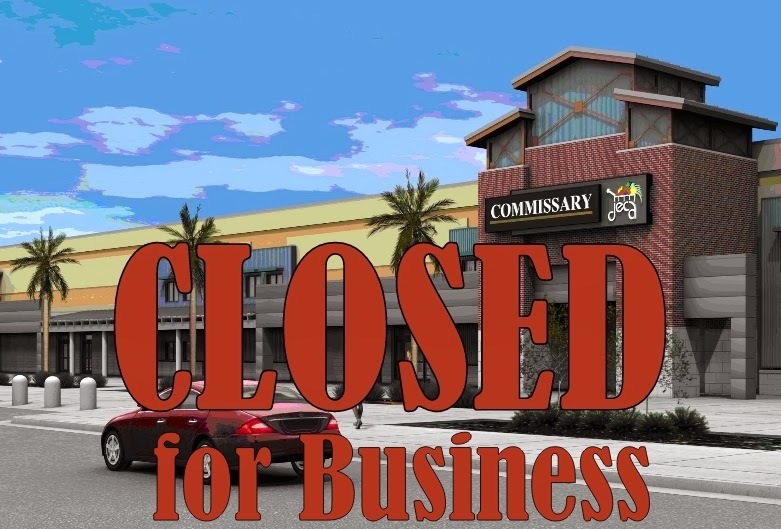 Do you see the closing of the commissaries as a big deal? Do you think I am blowing it out of proportion? Will the Tricare fee-hike affect you? What is one of the most important benefits to you as a military-family and do you think it is in jeopardy? Let's be sure to take the time to write our Congressmen. Let them know they can keep their so called "military-appreciation" and that we, the military-family, are not a force to be reckoned with! Expect to see more of this. what many do not understand is that many benefits such as commisaries, exchanges, housing etc. are from a time when the military was payed much less than the private sector. Nowadays pay is equal to or higher than many in the general population so many higher ups no longer see these as needed to subsidize paychecks. Sir, I respectfully disagree with your assertion that military pay is equal to or higher than the private sector. Military pay is woefully lagging in so much as the military still receives a Basic Allowance for Housing (BAH) and still only $279 per month for rations. The reason they have these allowances is so that their ability to live in a manner that is keeping with the nation's promise to take care of those who defend her is not compromised; if it were not for these allowances, our military families would be forced to live in some of the poorest housing areas, send their kids to schools that are not safe and be forced onto food stamps; can you imagine being on a deployment to Afghanistan or some other “hot-spot” and have to worry about your families safety, if they were going to be able to afford groceries? Trust me; it would not be easy to concentrate on your duty with that weighing on your mind. Further; with the privatization of Military Family Housing, the quality of the housing has increased substantially but the quantity has not; in fact due to budget cuts and cost overruns with some of the contractors, the quantity has actually decreased in some areas of the country; this is forcing our military members to move off base into the all too eager local real-estate market where you can bet that every landlord and property management agency knows exactly what their rate of BAH is. As stated earlier, your assertion of equal or higher pay is debatable and in my opinion erroneous. As a retired First Sergeant, I have seen firsthand how little some of our younger Airmen and NCOs make and without benefits such as the commissary and the Exchange, they couldn't make it. I for one am ticked off at our government and their lack of vision concerning this country’s path, it seems that they are only concerned about the next crisis and how are we going to stave off yet another shutdown. They have forgotten that the only reason they have their cushy little public appointments is due to the fact that several million men and women have paved the road to their prosperity with blood; blood spilled defending this nation and her values, principles and way of life. Additionally the government has forgotten the terrible sacrifices made by these men and women AND their families; because of their forgetfulness they have reduced these hero’s and their families to just another accounting line; an accounting line that can be cut and whittled away until all of the promises that this nation has made to her military members and veterans have been eroded or deemed to be not cost effective. So the next time someone asks whether or not you support the military commissaries and exchanges, please think about the point of view that I have presented here and know that it comes from a career Airman that has been there and done that and has the blood stained tee-shirt to show for it. Mr. hatcher, rather arrogant of you to assume I have not served my country. I too am a retiree but when all pay and allowances are calculated military members are doing better than many in the private sector. Don't take my word for it go the DFAS website and use their pay calculators. Show me someone on the outside with a high school education and less than four years on the job making the same pay and benefits. As for careerists, Army Times recently reported the average compensation for an enlisted member is over $55k a year and the average officer salary is just over $100k. That is more than the average family income of the American public. Even as a retiree I am tired of the lie of low military pay being promulgated. I am not saying those in uniform should make less but many have never worked in the private sector and do not understand their total compensation. And by the way Mr. Hatcher a good portion of right leg is pins and rods and an artificial knee from my military service, hang that next to your "blood stained t-shirt. VERY well said Capt Buck! Personally, I don't see the commissary saving that much over civilian supermarkets...especially if one buys store brands. The only people who 'benefit' from the commissary are those actually living on base. The BX is not much better as the only real savings are buying big ticket items as there's no sales tax...even then some stores offer just a good deals. As an AF retiree, there's no benefit to using the commissary. I live 13 miles from the base, so avoiding time, gas and traffic trump the few bucks I MIGHT save at a commissary. I have just finished contacting my Congressional Rep and suggested that rather than close the military Commissaries, the military close Base golf courses all over the world and divert the MWR funding from an enterprise that feeds no one to an enterprise that feeds millions. As a Navy retiree I value my Commissary access over that of any other benefit. I shop with my wife on a regular basis and I can say with certainty that the savings we accrue through its use far exceeds the cost offset of shopping in the local grocery network. Even at Walmart, prices are so high we wonder how civilians can afford such costs! I cannot help but wonder at the voices who suggest taking away food to offset the sequestration cuts. The Commissary at NAS Oceana was running solidly in the black prior to the Budget Battle Shutdown. When it was over, the losses from the closure and product wastage exceeded 80 million dollars and put the store into the red. Who do I blame for that? Congress, which tends to do things nowadays without forethought or planning or cognizance of the consequences. They put my Commissary at risk, then a raft of voices arise seemingly out of nowhere clamoring that a bloated, over-funded, and unprofitable military 'business' enterprise be killed. Somewhere down the line you can bet some clever politician will suggest that a private company take over the Commissary system - and so the graft and corruption goes on... while military families go malnourished, underfed, or even hungry for lack of basic staples they can no longer afford. As frequently, it is the spouse left to do the "chore" of shopping for food, yet the decisions are frequently from the male "brass", I surely agree with Kimberly! My spouse and I are both USMC vets. We served as lowly enlisted and as midgrade officers; and in both cases had to buy food for the family. Let me tell you--there is a big difference in pay between ranks as well. So yes, close those golf courses and in doing so, perhaps local parks for our childlren, better housing, and commissaries can be supported. Long ago the Spec Services were eliminated that once provided free/cheap benefits for sports and leisure--that went away so civilians could run the show. We saw the migration to high-end items sold at our Exhanges/PXs that few can afford. We saw often great military provided on-base dental/medical/hospital turned over to those that wore turbins as part of outsourcing. The so called benefits of service have so been slashed that the only one of note is that following discharge in gaining entry level pay jobs offered by corporations. Gve me a break! Well said, Mike Hatcher! I would love to see this subject get national coverage on all media outlets and see interviews with military families. I honestly don't think that the commissary is all that much cheaper on a lot of things. Yes they have special buys on things but I have gone to Wal-Mart and got things a lot cheaper. The bx/px is overpriced also so it's no great loss for me. I rarely go to the exchange or commissary. Capt. Buck, I'm not sure what you mean by my arrogance of assuming that you had not served. I thank you for and respect your service; but never in my post did I make any remarks that would disparage or in any way try to discount you based on that fact, I didn’t know one way or the other whether you have served or not; I simply gave my take on the issue from my point of view and provided a reference point from which I was speaking. However, for you to use the "total Compensation" argument to compare the "private" sector pay and benefits to the military pay and benefit package is comparing apples and oranges. First, your point concerning the two types of compensation is invalidated due to the fact that no private sector employee is asked to lay their life on the line for this country, members of the military do this every day, you should know this, and you still argue that "total" compensation provides more for the military than their private sector counterparts? I have seen what the private sector has to offer, they have wonderful program managers, they track their metrics with the very best of them and they can tell you what the forecast demand for widgets is within one-tenth of one percent. But ask them to do what a high school graduate with less than 4 years on the job does and see what reaction you get. These high school graduates can operate multi-million dollar combat vehicles, they can figure the reverse azimuth of a mortar round and return fire in under 60 seconds, they can figure the amount of food they need to feed thousands of men and women under some of the worst conditions imaginable and they do it because they want to, no one held a gun to their head and forced them to; and oh buy the way when asked to do something that might be outside of their job description, about the only comment you'll get is "well if it'll keep the mission going, I'm all over it." Find me one "private” sector employee that can do what these kids do as well as they do it and not complain and I'll shut my mouth and never defend our guys and gals again. If you ask a “private” sector employee to do something other than sit at a computer all day they get so bent out of shape that some will call the mental health line do to stress and depression. The only thing the private sector is concerned about is their paycheck, their parking spot and getting the keys to the executive washroom; and if keeping the commissary and exchanges open costs a little extra money to take care of the one-tenth of one percent of Americans who find it honorable to defend these "private parts" then so Beit, and as for your disdainful comment about my bloodstained t-shirt, I'll just consider the source and move on with the knowledge that a real combat veteran would never have made a remark like that. Capt. Buck: How many decades did it FINALLY get us comparitable pay with the civilian sector? In case you forgot, we're on duty 24/7, 365 days a year and put our lives on the line daily...as you can attest. Tell us what civilian job pays 24/7, 365 days a year. Salaried jobs - I hate to disabuse you of your sacrifice, and as a retiree myself I can attest to to long watches on endless deployments, in war and peace, but as a civilian paid on a salary basis I am expected to be on call at all times to respond to the needs of my employer. A salaried position is a promise of commitment to the company's goals. I'm not going to get shot at, but I get the mid-night calls, the long over time without compensatory time off or overtime pay. Bonuses make up for a lot that, but otherwise, the differences are relatively few. And this comes from a Vet who fought in the first Gulf War while my family stood in government food lines back home for free cheese and peanut butter at a time when my total annual income was around $22000 for a family of four when BAQ was $400 and the food allowance was suspended while aboard ship. I recently lost my job due to the death of the company's owner. Because I didn't have the money for a babysitter my parents watch my daughter while I was at work. My mom has breast cancer and is only available three days a week due to her treatments. My former employer was very gracious is working around her schedule but I can not expect a new employer to work with me in the same manner. So I will not be working effective 12/20/2013, right now we are barely making ends meet without the commissary there is no way it will happen. It was going to be rough going for the next few years anyway. Now if I have to shop at the local grocery store, I don't think we'll be able to stay in our house.